The Camera menu allows you to set various camera parameters. Select Camera > Camera settings... to open the camera settings dialog. Default camera to select the default camera. Maya style camera to select the Maya-style camera. 3ds Max style camera to select the 3dx Max-style camera. See Moving the camera for the mouse combinations for the three camera modes. Set the horizontal or vertical components of the field of view angle and the focal length. Horizontal FOV and Vertical FOV: A large field of view widens the lens to allow to you see more of the terrain with the camera; a small field of view narrows the lens to allow to you see less of the terrain with the camera. Focal: A longer focal length narrows the angle of view and increases the magnification; a shorter focal length widens the angle of view and decreases the magnification. Default: Resets the values to the default values. 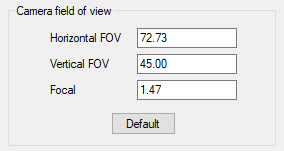 The FOV is stored in the user preferences and is not taken from the terrain file. Set the camera field of view angle. Invert zoom: Reverses the direction of the camera zoom relative to the mouse movements in a Horizontal or Vertical direction. To zoom in, move the mouse up or to the right; to zoom out, move the mouse down or to the left. Invert rotation: Reverse the direction of the camera rotation relative to the mouse movements. 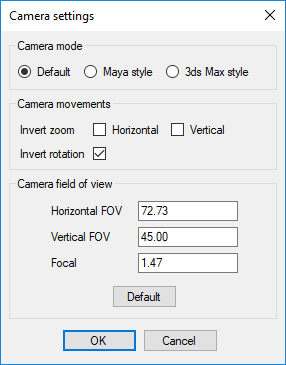 To save the current camera, select Camera > Save camera to save the camera position in the terrain. To open the next or previously saved camera, select Camera > Go to next camera or Go to Previous camera. To manage the camera list, select Camera > Manage camera list. 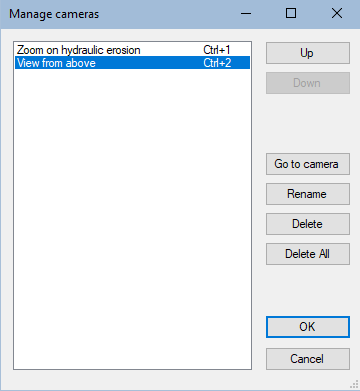 The Manage cameras dialog lists the saved cameras. Up or Down to change the order of the cameras. Rename to edit the camera names. Delete or Delete All to delete the selected camera or all cameras. OK or Cancel to validate or cancel the changes.